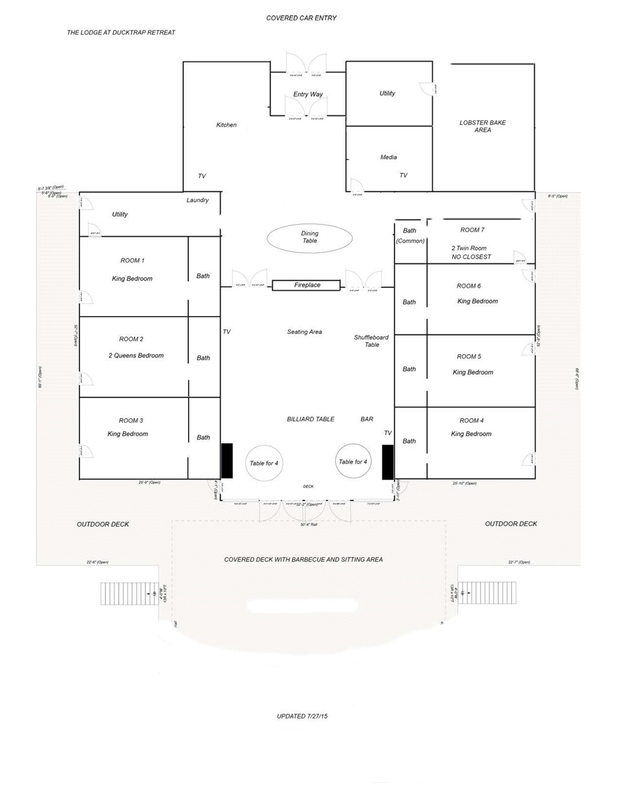 BEDROOM LAYOUT: (Be sure to click the link to floor plan under the main photo above) Guest Rooms - 6 guest rooms (5 with king beds, 1 with a double queens) and a room with 2 twins and ensuite bathroom, great for kids! Each room has a TV, closet, mini-fridge and sitting area as well as private access. One of Midcoast Maine's largest vacation properties, The Lodge at Ducktrap Retreat sleeps 16 people in 7 guest rooms comfortably providing a private resort experience. This gorgeous property has beautiful landscaping, rolling lawns for summer BBQ's and field games, an outdoor heated pool with luxurious lounges and sitting areas as well as a pool house for hours of enjoyment. The fire pit is the perfect place for memorable summer nights of fun roasting s'mores or enjoying a glass of wine under the eastern sky. The tennis courts are available for guest use (please bring own equipment) and the property is minutes to the Northport Golf Club as well as the Goose River Golf Course. Camden is a short 8 minute drive and Lincolnville Beach is minutes away. This property is centrally located along the coast to allow day trips to Bar Harbor, Belfast antique shopping, dining in Rockland, museum visit, and much more! As you drive up to the property, a large parking area is available for many cars. Walk through the double doors into the large dining foyer with seating for 16 people, continue to the gourmet kitchen with high-end stainless steel appliances, a fully sized ice maker, 2 dishwasher, amazing cookware and glassware for every occasion. Bar seating and ample counter space for preparing everything from family pancake breakfast to Thanksgiving meals. Off the reading/media room is an enclosed, covered dining and entertaining area with a lobster/steamer cooker and outdoor seating. The spacious great room has a stone fireplace which is great during the cooler nights to enjoy reading, playing board games, or watching a movie all while feeling at home. The billiard table and shuffleboard await hours of fun! The fully stocked bar has a flat screen TV, full sized ice maker, sink, and all the tools needed for a refreshing cocktail. Continue out the glass doors to the hub of activity - the covered deck! This deck has a large propane BBQ with bar seating, meal prep space and numerous sitting areas for gathering and enjoying views of the pool and peeks of the ocean. Each room has private access with a designated code and enters into a guest room with a TV, mini-fridge, sitting area, closet, and en-suite bathroom. The two king east facing rooms have sweeping views of the grounds and ocean views with direct deck access. The twin room is perfect for kids as the room has shared access to the en-suite bathroom and king room, but a separate TV and door to close for privacy. This property is located in the gated community of The Homes at Ducktrap Retreat and has shared access to the pool, pool house, tennis courts, nature trails, and fire pit. Most of the cabins are individually owned within the association. Each owner is respectful of the space and we expect our guests to respect the shared areas and neighbors. Events are not allowed at this property which includes but are not limited to the following: weddings, bachelor/bachelorette parties, wedding receptions, corporate events, family reunions, holiday gatherings, and parties. This property adheres to a strict 7-night minimum, so is not available for weekend getaways or gatherings. Please adhere to the occupancy noted above. Some may recognize this as the former event hall at the Ducktrap Retreat. Over the winter of 2013/14, the Lodge was converted into a massive residence for vacationer renters. (The cabins have all been sold off individually and the property is now a gated community). NEED MORE SPACE? SLEEP UP TO 20! Trail's Edge is a cabin within the gated community and is available to rent in conjunction with The Lodge at Ducktrap Retreat. Sleeping four guests in its own updated and comfortable private space, it offers a gourgeous kitchen, spacious living area, two beds and baths. For an extra cost, you can add this property to your reservation. Trail's Edge also includes access to the pool, fire pit, and tennis courts. BOATS INCLUDED? None, however if you are looking to rent kayaks, Maine Sport, Water Walker or Ducktrap Kayaks offer those and can deliver them to the Property. SECURITY DEPOSIT: Yes, the owner of this property DOES require a $500 refundable security deposit to be returned within 30 days after a satisfactory stay. OFF-SEASON PRICING: In order to make some of our larger properties more attractive to smaller groups in the Off-Season, we've created a Custom Pricing Option. Pricing for rentals that occur in the advertised Off Season (1/1/19-6/17/19 and 9/9/19-12/31/19)for this property are based on 6 people. Additional people, up to the maximum allowed for the property, will be charged an additional $175 per person - per week if a rental occurs in these time-periods. Guest must select this option during the reservation process. Cleaning: The property will be professionally cleaned before and after the rental, additional cleaning will be billed to the Guest at an hourly rate. Entertainment: Yes, in each bedroom (cable service), living room, bar area, in the kitchen, and in the media room. Some televisions come with a DVD player and DirecTV satellite service. There is also a mini-iPad provided for Guest use, located in the kitchen, connected to the stereo system with Sonos, for music. Water Frontage: Directly on the Ducktrap River - a path between two cabins off the pool area leads to the river. Arrangements were easy to make, and the staff was very accommodating of periodic questions and requests. I left a book behind at check-out, and they were kind enough to mail it back to me. Our stay at the Lodge at Ducktrap for Thanksgiving was everything we had hoped for. The property is amazing and lends itself perfectly to a big family gathering, with plenty of space for everyone to gather together and enjoy each others' company while taking advantage of the many wonderful features of the giant family room. The kitchen was perfect for cooking a huge Thanksgiving feast. The house was beautiful and more than big enough for our group. We loved the open feel of the house and how we never felt like we were anywhere near being on top of each other. I can't say enough good things about all of the OTWIM team. We enjoyed how spacious the property was. our families loved the pool and firepit area. The covered area was perfect to bring lunch down and have a quick bite while swimming. What a wonderful experience, again. It's our second time renting through On the Water in Maine and a huge amount of thanks go to Justin and all those who made us feel so special. Anytime we had a question, it was as if we were the only party they were caring for. We all have wonderful memories and are eagerly looking forward to renting again from you. This lodge was so fully equipped with high quality dishes and appliances, making food preparation, serving, and clean up so enjoyable. There is plenty of space and chairs everywhere to gather together (6 couples in our group) for every activity throughout the day and then retreat to our own comfortable, private bedrooms and baths. Not to be missed is the day sails and/or harbor cruises in Camden; and touring & shopping in Belfast, Camden, and Bar Harbor made easy by central location of this property. Spectacular property, great weather, wonderful friends, and fun recreation made all seven days the best vacation ever! This was our second gathering on the coast of Maine and best yet. I just have to mention the squeals and yells of enjoyment coming from the pool table and shuffle board table competitions. The agency was easy to work with and welcoming of questions. We had no issues during our stay but had a 24-hour number in case anything came up. Would happily rent through On the Water in Maine again. The deck was spacious and comfortable, and the view was even better than expected from the website photos. We loved spending time at the pool, grilling and lounging on the deck, and playing family pool tournaments at night. The separate bedrooms gave everyone lots of privacy, and the kitchen's layout (including two dishwashers!) allowed plenty of space to cook for our group of 9. A really lovely place for a family vacation. Everyone at On the Water in Maine was very nice and helpful. The Retreat was perfect for our group of families vacationing in Maine this summer. All the families enjoyed playing pool, shuffleboard, visiting on the deck. With so much information to absorb to prepare for our arrival given that we were unfamiliar with the property and the area, I called the office several times with questions and clarification. The office staff was extremely friendly and helpful with each call..no question was a stupid question! We had a wonderful week at rhe Lodge at Ducktrap Retreat. The house was fully equipped to house 16 people comfortably and we plan to return again! Great location, close to Lincolnville Beach and Camden. Fantastic views from the deck, kids liked the access to the Ducktrap river from the property. We took advantage of the tennis court, heated salt water pool and the shuffleboard and pool table. Everything was top notch. The property management team was very responsive and professional. We appreciated the detailed house information and directions that were sent to us. We loved this house! The kitchen was a dream to work in. It was laid out so efficiently and extremely well-stocked with labels on the cabinets and drawers so things were easy to find. There are two sinks. There are two dishwashers in the kitchen and one in the bar. The refrigerator is huge -- we had no trouble fitting 4 family's worth of food in it. The seven bedrooms each with full sized bathrooms made it so easy for everyone in our big group to get ready in the mornings. The veranda with the view of the bay was a great place to hang out with plenty of comfortable seating. The heated pool was beautifully landscaped and there were restrooms right at the pool. Justin and his team at On the Water in Maine made it so very easy to rent and enter the property. They sent me all the detailed information I needed at the perfect timing to ensure everything went easily and perfectly, which it did. They made it so easy! A completely decadent, comfortable, huge, amazing property! The gourmet kitchen was a dream to cook in, the deck and bar area was a dream to entertain in, the view was gorgeous and access to a community pool was perfection! The staff at On the Water in Maine went far out of their way to accommodate my family as one of us is wheelchair dependent. The property owner and OTWIM staff made an exception for me to do a site visit prior to contact signing to be sure that the property was accessible for my Dad. Additionally, OTWIM made provisions for his hospital bed to be delivered to the property prior to our arrival. While we were there, a light bulb high on one of the bathroom ceiling fixtures burned out and OTWIM was there to change it. They were also more than willing to help us with climate control issues in one of the bedrooms too! Like they say in their mission statement...no issue is too small. Fantastic service! 5 Star Accommodations. Pool was THE NICEST pool I ever swam in - magical waters. Great for our family reunion as it offered wonderful common spaces for family fun and private suites for quite times too. Very friendly and helpful personnel at the rental agency On the Water in Maine Justin answered all my emailed questions promptly Email with daily activities was helpful in planning what we were going to do, especially since this is our first trip to Maine. We LOVED the lodge, here are some reasons why: Gourmet kitchen with a huge sub-zero refrigerator/freezer, Viking stove with 6 burners, 2 wall ovens, microwave, ice maker, trough sink, island with sink, flat screen TV, tons of dinnerware/silverware assorted glasses GREAT room with fireplace, big flat screen TV, billiards table Bar area complete with mini-refrigerator, wine refrigerator, ice maker, sink, dishwasher, another flat screen TV Central AC throughout the entire building, with individual thermostats in each bedroom and the main rooms in the lodge Non-smoking house some of us are allergic to smell of smoke Six nice size bedrooms with en suites and flat screen TV in each Keyless entry to the lodge and the 2 bedrooms facing the pool makes for easy entry, no more looking for the keys Covered deck with large propane gas grill, mini-refrigerator, bar chairs, Adirondack chairs, Pool was great Water pressure was strong, even when multiple people were taking showers Great that user manuals were handily available. We had to program the dishwashers to ignore that there was no rinsing agent. The dishwasher wouldn't start with this error. We did as requested and reprogrammed it back to "normal". No Smoking is permitted anywhere on or inside of any of our rental properties nor are those who may partake in tobacco smoking allowed to occupy any of our properties. 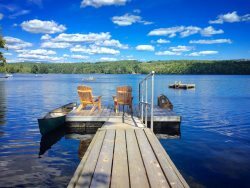 Lincolnville is on the coast with lakes, ponds and the ocean beaches - while Searsmont is inland from Lincolnville and has several great ponds and lakes with great fishing. At popular Lincolnville Beach, sections of sand and pebbles (depending on the tide) draw visitors for play and relaxation. The shallow water is ideal for wading on a warm day.